Weekends where T.J. has all three nights off are few and far between so we do not like to waste them. He often has grand ideas for these golden weekends and will proclaim "lets go away!" Of course sometimes he forgets to tell me his schedule until the Thursday before and it's too late for me to plan anything, or he's too exhausted from the week to do much more than binge on Netflix. But this past weekend I had enough notice to do some research and find a place for us to escape to for a couple nights. It couldn't be anywhere too far of a drive (I found an adorable Airbnb in Bend that I've bookmarked for a longer weekend since it's about 5 hours away), and it had to be dog friendly. 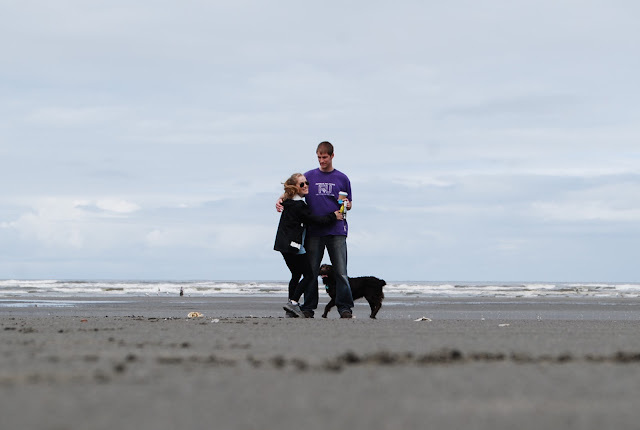 We've been wanting to go to the coast for a while now so Seabrook, Washington checked all our boxes. I packed his weekend bag for him so that the second he got home from work all we had to do was load up the truck and the dog and hit the road. Seabrook is a little beach town not quite 2 hours west from our home. It sits up on a tree lined bluff overlooking the ocean and is chock full of coastal sweetness. All the beautiful shingled homes are privately owned and perfectly designed to create the most adorable, walkable little community. When we arrived we got checked in at the rental office, and were given our pool key (that we never ended up using) and a cute welcome bag with shower items, dog treats, popcorn and other little goodies for our stay. 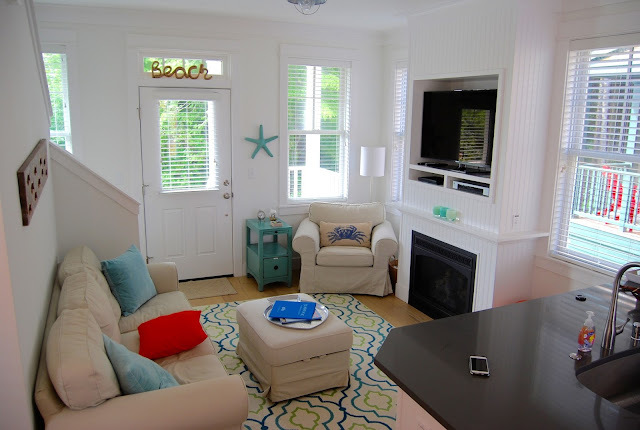 I had rented a little two bedroom cottage named Sandy Crab and it was just perfect for the three of us! Since we'd gotten in kind of late we pretty much went right to bed and were excited to explore more the next day. We woke up early (thanks Hunley) and had a bite of breakfast in our house before making our way to the beach. The whole way there I was snapping pictures and exclaiming every step how simply adorable this town is! It's pleasantville perfect. The sidewalks are made of crushed shells, the homes have large cedar porches, and colorful shutters and doors, flower boxes and picket fences. 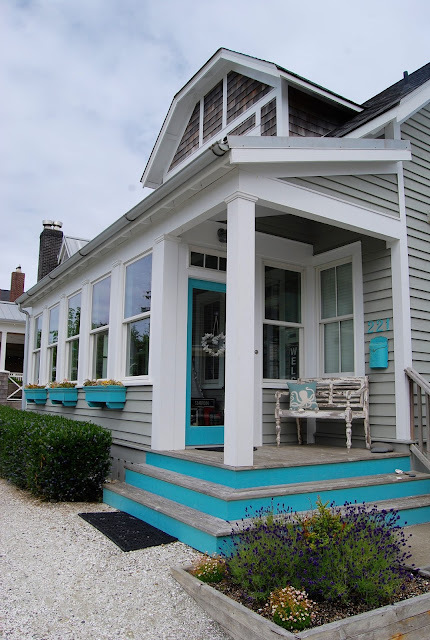 I loved getting to meander around the town and try to pick which home was my favorite, an impossible task. 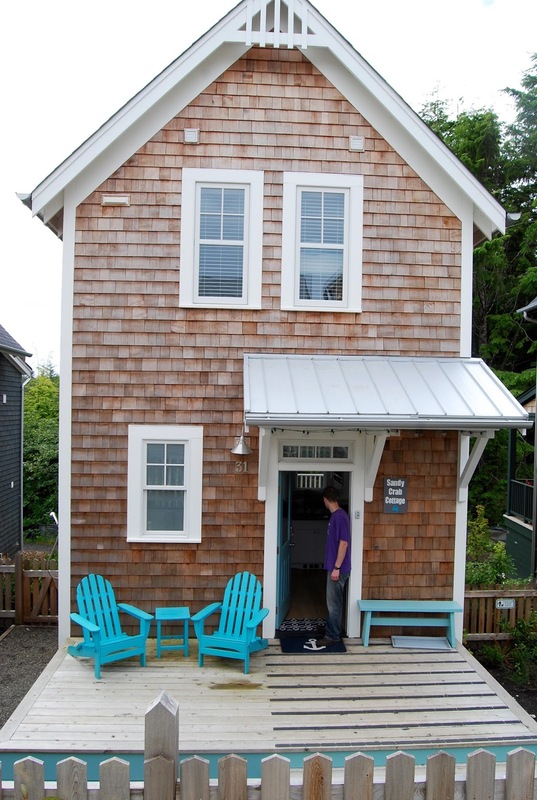 We passed the town hall and then arrived at the Red Velvet Bakery by the Sea where T.J. grabbed a coffee before we started our climb down the twisty steps to the sandy beach below, trying not to break our neck as Hunley dragged us most of the way. Though the morning has started out sunny enough, some dark clouds had rolled in as we'd made our trek to the beach. But we stuck out the drizzle like the good Pacific North-westerners we are now, and were soon rewarded with just overcast skies. Hunley was in seventh heaven having the entire expansive beach to run on. He chased seagulls and splashed in the waves and ran back and forth between T.J. and I until he was completely exhausted with his tongue hanging out the side. 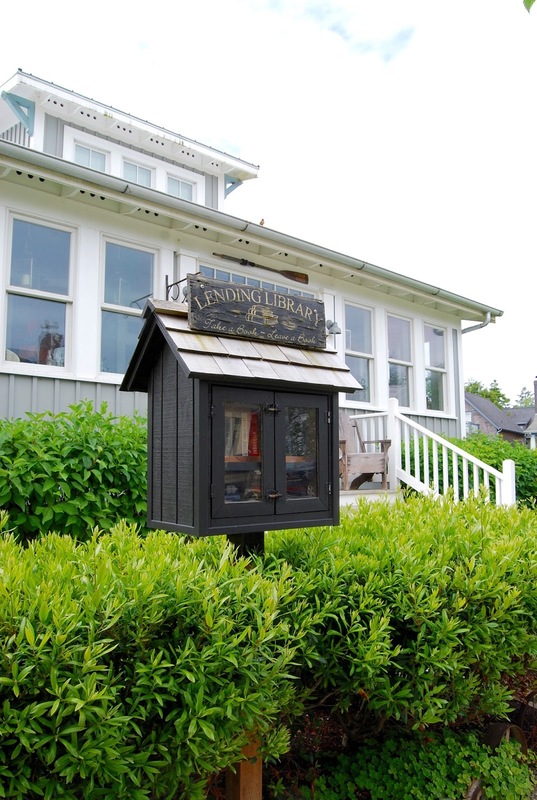 We walked back to our house on a different path and passed more adorable homes, public fire pits, bocce ball courts, and the cutest "Lending Library." My favorite vacations involve a good mix of activity and down time so after our morning excursion we plopped ourselves down on the couch, wrapped up in blankets, to watch a couple hours of our new TV series (I'm not going to say which series, though, because it's been over for years and yet somehow I haven't had it spoiled for me yet). When we were satisfied with our couch potato status we ventured back outside and were pleased to see the sun had broken through the clouds in full force. We headed back to the beach, this time by way of the affectionately named "Gnome Trail." This dense, wooded, mossy trail, is not exactly what we think of when we picture the beach, and we kept questioning whether we were headed in the right direction, but sure enough, the trees cleared and we found ourselves a bit further down on the beach than our earlier excursion. This time on our way back to the house we checked out some of the other shops and restaurants in the town. 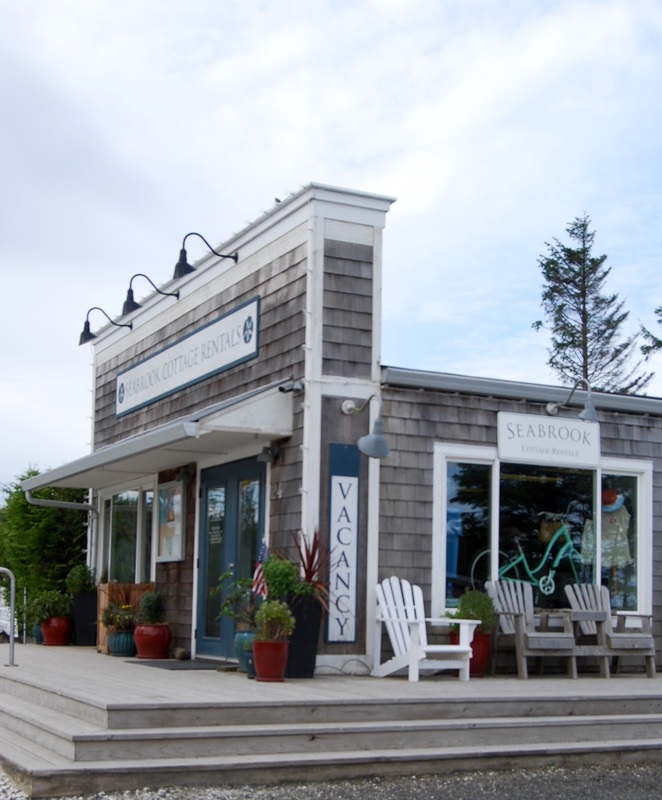 There are two restaurants, a wine and cheese shop, a cute ice cream and candy store, and a market where you can pick up supplies for s'mores or sandwiches, plus plans for future shops. I think it would be so fun to come back here in a couple years, maybe next time with some family in tow, and see what new adorable cottages and restaurants have popped up. We got showered and left the dog behind and went to enjoy a nice easy dinner together at Mill 109, with views of the setting sun sparkling off the ocean. On Sunday we went back to the beach for one last frolic before we had to pack up our gear and head on home. We had the whole beach to ourselves and we're joking about how different it would look if this was a beach on the East Coast in June. For one thing, I don't think I've ever worn rain boots and fleece to the beach in South Carolina. But regardless of what coast I'm on, there is just something about the ocean, something that pulls at my heart and catches my breath like no other place on Earth. We were sad to be leaving so soon after arriving but I am so glad to know this little slice of paradise is just a short drive away from our home. It's so crazy to think this is a piece of the country we might never ever have visited if not for this crazy journey we're on. These weekend adventures are like water for the soul. We come home with stories to tell and memories that we'll share forever. I feel lighter and refreshed and ready to face another week of late nights alone. So no matter how last minute, or how hectic the week before has been, I'll say yes every single time T.J. tells me "let's get the heck out of town." Just to go somewhere, anywhere new, together. What a fabulous weekend!! Almost makes me want to trek across the country just to see that sweet little town and that huge beach! Thanks for letting us peek at your fabulous get-away! Oh this was so sweet! Your pictures are lovely and you two are the absolute cutest! Awww... What a precious getaway! I'm glad you had fun!!! I LOVE Seabrook! It is such a cute town. Glad you had a great weekend! Awww...I love this post. What a great time. I love that last photo of your sweet dog. That is a cool photo! This place looks so adorable! Pinning for later! What a gorgeous spot to spend a few days away together! We haven't explored any of the Washington Coast since we usually stay closer to home too and the Oregon coast is just about an hour from us, but this town is adorable! I am definitely bookmarking this spot for a weekend adventure in the future! We definitely still want to go to the Oregon coast while we're living out here! I don't know how I'm going to see all the beautiful places out here. My PNW bucket list grows every. single. day. These are such beautiful pictures! So glad you had time together! 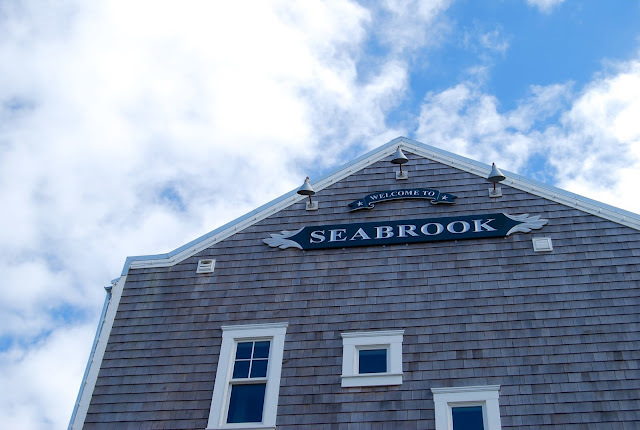 I will definitely be checking out Seabrook now! Thanks so much for this awesome review. It looks like the perfect weekend get away from Tacoma! It was so easy to get there! And most of the trip is NOT on I-5 which is always a double win in my book! Yes! It definitely felt sort of Nantucket-y. Ok this might be the cutest little branch town ever. Glad you had a nice weekend together!